Aristotle held that gratitude was not a virtue, because it was considered weakness to show dependence on others. In his view, the megalopsycholos (or “great-souled” man) is “the sort of person who does good, but is ashamed when he receives it; for doing good is proper to the superior person, and receiving it to the inferior.” This concept could be why Western society views self-sufficiency and autonomy as such a virtue. Joseph Stalin—the Russian dictator—characterized gratitude as a disease. He famously said, “[Gratitude] is a sickness suffered by dogs.” By contrast, biblical gratitude isn’t a sickness, but a medicine for our souls. G.K. Chesterton converted to Christianity at age 48, because he was thankful, but he didn’t know who to thank. He famously wrote, “The worst moment for an atheist is when he is really thankful and has no one to thank.” We can be thankful for material objects, but we surely can’t be thankful to material objects. When I wake up in the morning, I’m thankful to have a hot cup of coffee, but I never thank the coffee itself: I thank my wife for buying or brewing it for me. “You can begin right now to feel healthy. You can begin to feel prosperous. You can begin to feel the love that’s surrounding you—even if it’s not there. And what will happen is, the universe will begin to correspond to the nature of your song. The universe will begin to correspond to the nature of that inner feeling. And manifest, because that’s the way you feel” (Rev. Dr. Michael Beckwith D.D. “Visionary,” The Secret, 19 minutes). “Your thoughts and your feelings create your life. It’ll always be that way. Guaranteed!” (Lisa Nichols “Author,” The Secret, 20 minutes). We reject this concept of “New Age mind power.” Our beliefs have a massive effect in us, but they do not affect the external world around us. Not only does this view lack any substantive scientific basis, it also seems cruel to those going through suffering, because it “blames the victim” for not thinking enough positive thoughts. Biblical gratitude is in another category altogether (For a more complete critique, see New Age Spirituality). Biblical gratitude is grounded in God’s love for us who are unrighteous, rather than in self-righteousness. The English word “gratitude” derives from the Latin root gratia, which means “grace, graciousness, or gratefulness.” The term most often translated as “thanksgiving” in the Bible is the Greek word eucharistos, which comes from two Greek roots: eu meaning “good” and charizomai (or charis) meaning “grace.” It isn’t a coincidence that the terms “grace” and “gratitude” come from the same Greek root word: According to the Bible, at the heart of gratitude is a response to the overwhelming grace of God. Biblical gratitude includes giving thanks for “all things” (Eph. 5:20), not just our spiritual blessings. After all, the Bible teaches that “every perfect gift is from above, coming down from the Father of lights” (Jas. 1:17). Seen in this light, believers in Christ should thank God for all of the blessings he gives us. Christians are not ascetics who deny themselves the pleasures of material goods or sensual experiences. Instead, “[God] richly supplies us with all things to enjoy” (1 Tim. 6:17). God doesn’t want us to experience guilt from his blessings, but gratitude. Mature Christians have developed the spiritual instinct of giving thanks for all the good things in their lives—from the least to the greatest. At the same time, biblical gratitude goes far deeper. An illustration may be helpful: As toddlers, we probably learned to give thanks to our parents for giving us dessert after dinner. There’s nothing wrong with this; in fact, it was good for us to express our gratitude in this way. However, true maturity occurs when we develop a deeper gratitude for the greater sacrifices they made for us. In a similar way, biblical gratitude isn’t less than giving thanks for the material blessings in our lives, but it is more than this. Why does God command us to be thankful? The Bible contains many imperatives to give thanks. But why? If another person constantly pestered us thank him, we would (rightly) believe him to be massively narcissistic or immensely insecure. Is God in this same category? Not at all. God doesn’t need our thanks. After all, the God of the Bible is self-existent, which means he has no needs. In the community of the Trinity, God is completely secure and satisfied, lacking nothing. He suffers from no cosmic loneliness or celestial insecurity. Instead, God calls us to give thanks—not for His benefit—but for ours. Just as we cringe at the tantrums of spoiled, unthankful children, God wants to teach us to be grateful people, because this is good for our spiritual health and maturity. Refusal to give thanks leads to a poisoning of our minds. Paul writes, “Even though they knew God, they did not honor Him as God or give thanks, but they became futile in their speculations, and their foolish heart was darkened” (Rom. 1:21). In writing about the depravity of people at the end of human history, it’s interesting that Paul includes “ungrateful” in his list of serious sins (2 Tim. 3:1-2). We are all surprisingly ungrateful people. Jesus healed ten lepers on his way to Jerusalem. Leprosy (i.e. Hansen’s disease) invades the nervous system through a microbacterium that causes numbness, leaving the person prone to injury, sores, and blisters. These ten lepers dealt with this gruesome and embarrassing disease for years on end. However, even after being spontaneously healed, only one of the men came back to thank Jesus (Lk. 17:15-16). Isn’t that amazing! These men had been coping with a debilitating disease for most of their adult lives, and once they were cured, they never had the thought to give thanks. They were so busy loving the healing that they forgot about the Healer. Is it possible that we are actually far less grateful than these lepers? As believers in Jesus, we have been healed of far, far more. Left unchecked, human nature can receive one blessing after another—but still whine and weep for more. Is our problem essentially that God hasn’t blessed us enough, or is it that we’ve failed to appreciate what he’s already done for us? Will another blessing from God really change an ungrateful attitude in our hearts? Our major problem isn’t that God hasn’t blessed us, but that we don’t recognize it. Gratitude is one of the keys to being “filled with the Holy Spirit.” Paul tells us that to be filled with the Spirit looks like “always giving thanks for all things in the name of our Lord Jesus Christ to God” (Eph. 5:20). Paul writes, “There must be no filthiness and silly talk, or coarse jesting, which are not fitting, but rather giving of thanks” (Eph. 5:4). “First of all, then, I urge that entreaties and prayers, petitions and thanksgivings, be made on behalf of all men” (1 Tim. 2:1). “Rejoice always; pray without ceasing; in everything give thanks; for this is God’s will for you in Christ Jesus” (1 Thess. 5:16-18). Gratitude is the central cure for anxiety. Paul writes, “Be anxious for nothing, but in everything by prayer and supplication with thanksgiving let your requests be made known to God” (Phil. 4:6). Even after just five or ten minutes of giving thanks, it’s amazing how we discover that our worries have disappeared and our spirits are lifted. It’s also remarkable how differently we then begin to petition God for more blessings, once we have come to appreciate what he has already given us. Gratitude never gets old for the maturing Christian. As Christians, we have immediate access to joy that can never be taken away. Chuck Swindoll says, “Joy doesn’t make you grateful. Gratitude makes you joyful.” The Christian life—from start to finish—should be an ongoing deepening of gratitude and joy. Paul writes, “As you have received Christ Jesus the Lord, so walk in Him, having been firmly rooted and now being built up in Him and established in your faith… and overflowing with gratitude” (Col. 2:6-7). Gratitude is the key to unity with other believers. How often do we discover that bitterness, annoyance, and contention with other believers disappears after we sit and give thanks for them? Paul writes, “Let the peace of Christ rule in your hearts, to which indeed you were called in one body; and be thankful” (Col. 3:15). The “peace of Christ” here does not refer to inner peace (Jn. 14:27), but to relational peace with fellow believers. Martin Seligman (University of Pennsylvania Psychologist and President of the APA in 1998) found that the “gratitude visit” immediately increased happiness by 10%. But these results cut in half in a week were totally gone in six months. The “three good things” exercise was to “write down three things that went well each day and their causes every night for one week. In addition, provide a causal explanation for each good thing.” This was only a 2% increase in happiness in a week, a 5% increase after a month, but 9% at six months. Depressive symptoms declined by 28% after one week, and continued to lower as it continued. Robert Emmons (psychologist at University of California) found that gratitude massively affects our happiness. His first study lasted for ten weeks. On a weekly regimen, three different groups recorded either (1) “blessings,” (2) “hassles,” or (3) “events.” The participants “completed an extensive daily journal in which they rated their moods, physical health, and overall judgments concerning how their lives were going.” They were given a -3 to +3 scale. 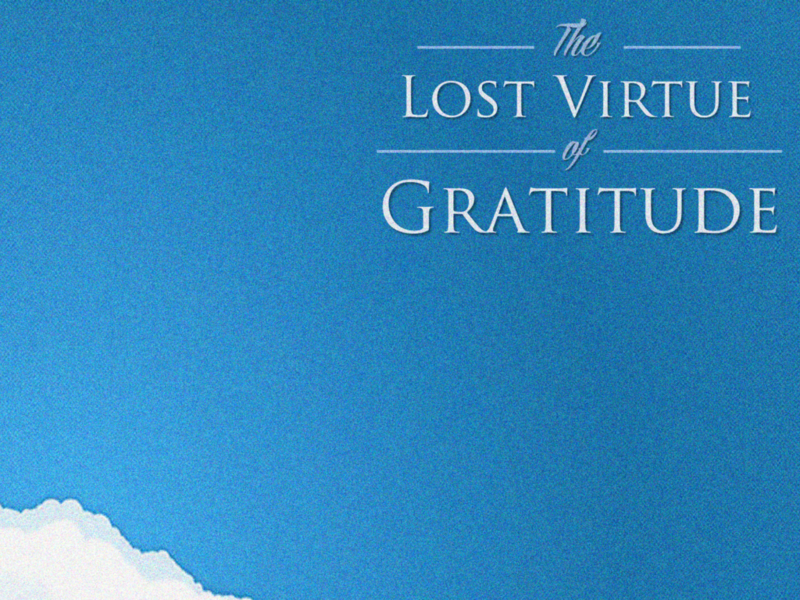 12 studies have supported the link between gratitude and subjective well-being. This is consistent with survey results suggesting that over 90% of American teens and adults indicated that expressing gratitude made them ‘extremely happy’ or ‘somewhat happy’ (Gallup, 1999). Gratitude appears robustly related to mood and life satisfaction. A large epidemiological study examined the role of religiously orientated ‘thankfulness’ in predicting the lifetime history of nine psychiatric disorders (assessed through a diagnostic interview). Thankfulness predicted signiﬁcantly lower risk of major depression, generalized anxiety disorder, phobia, nicotine dependence, alcohol dependence, and drug ‘abuse’ or dependence. Additionally, thankfulness was related to a much lower risk of bulimia nervosa, which is interesting given that interventions that increase gratitude appear to improve body image. [Studying Viet Nam veterans] To the extent that people with PTSD experience gratitude, they have better daily functioning, irrespective of symptomatology. The results suggest that interventions to increase gratitude may have beneﬁts for people with PTSD. Sara B. Algoe (Professor of Psychology at the University of North Carolina, Chapel Hill) performed a two week study to discover the effects of gratitude on romantic relationships. Both partners answered yes or no to these two statements: (1) “I did something thoughtful for my partner” and (2) “My partner did something thoughtful for me.” Then they rated their emotions on a scale of 0-6. Then finally, participants answered the question: “Today our relationship was _______.” (1-9 scale). Dr. John Gottman (Professor Emeritus of Psychology at the University of Washington) performed a study of 73 married couples where he quantified positive versus negative interactions between couples. For instance, a contemptuous facial expression (-0.4) measured differently than an expression of disgust (-3.0) or whining (-1.0). After filming the couples having conflict, he was able to predict with 94% accuracy whether they would stay married or get divorced. His famous ratio is that couples need five positive interactions for every one negative interaction (5:1). But what is our role in spiritual growth? Our responsibility, which God will not violate, is for us to learn to regularly say, “Thank you.” If you are waiting around for God to make you a more grateful person, don’t hold your breath… You will be waiting a very long time! God will not make us grateful people. Gratitude comes to those who choose it. Gratitude avoids platitudes and clichés. We need to learn to put our thankfulness into our own words, rather than mindlessly running through a routine or a list. Adaptation (getting used to the status quo) works against gratitude. If you use a gratitude list, that’s fine. But pause and ask the searching question: Why am I grateful for this today? Asking this question reveals to us what (and why) we’re thankful for. You thought you might go to hell if you died tomorrow. You needed to create an identity from your comparison to others. You could never read the Bible again for the rest of your life. You never met any of your close Christian friends. We take all of these gifts for granted, but when we imagine if these were gone, we discover just how privileged and prosperous we really are. Gratitude for how God made us. We spend so much time insecure with our body image, our lack of talents, or our general inadequacy in comparison to others. Christians frequently complain about the ways God hasn’t created them. However, David writes, “I will give thanks to You, for I am fearfully and wonderfully made” (Ps. 139:14). How often do we thank God for the positive ways he has made us, rather than complaining about what we lack? Paul even came to the point where he could give thanks for his weaknesses, knowing that these revealed God’s power even more than an exquisitely gifted person. Jesus told Paul, “My grace is sufficient for you, for my power is made perfect in weakness.” As a result, Paul could write, “Therefore I will boast all the more gladly about my weaknesses, so that Christ’s power may rest on me. That is why, for Christ’s sake, I delight in weaknesses” (2 Cor. 12:9-10). Gratitude for God’s power in spiritual growth. God is utterly committed to our spiritual growth (1 Thess. 4:3; Phil. 1:6). When we pray in faith for God to grow us spiritually, we can know in advance that this prayer will be answered, because it is in God’s will (1 Jn. 5:14-15). This is why Paul can write, “Wretched man that I am! Who will set me free from the body of this death? Thanks be to God through Jesus Christ our Lord!” (Rom. 7:24-25). Paul doesn’t write that Jesus might set him free, but that he will set him free. We can give thanks in advance, knowing that God will bring transformation and healing in the future. Gratitude for God’s power in building his kingdom. Because God is omnipotent, every difficulty is inscrutably small to him. The Creator of the universe doesn’t understand the meaning of the words “big problem.” This is why Paul can write, “Thanks be to God, who always leads us in triumph in Christ, and manifests through us the sweet aroma of the knowledge of Him in every place” (2 Cor. 2:14; cf. Heb. 12:28; Gal. 6:9). Jesus promised, “I will build my church” (Mt. 16:18). In the end, there is zero chance that the church will be overpowered by Satan, sin, suffering, or subjugation. With this in mind, why do we tie ourselves up in knots of anxiety and worry? We have no reason to worry, and every reason to be hopeful and give thanks. Gratitude for those under our spiritual care. Rather than griping about all of the problems in the church, Paul spent a significant portion of his time thanking God for his people. Specifically, he thanked God for the believers in Rome (Rom. 1:8), Asia Minor (Eph. 1:16), Philippi (Phil. 1:3), Colossae (Col. 1:3), Corinth (1 Cor. 1:4), Thessalonica (1 Thess. 1:2), and really all the Gentile churches (Rom. 16:4). He also spent time giving thanks for individuals like Timothy (2 Tim. 1:3) and Philemon (Phile. 4). Even when addressing the massive problems in the church in Corinth, Paul could still write, “I thank my God always concerning you” (1 Cor. 1:4). How much time am I spending giving thanks for the people God has given me the privilege to serve and influence for him? Gratitude for God allowing us to serve and lead for him. Paul writes, “I thank Christ Jesus our Lord, who has strengthened me, because He considered me faithful, putting me into service, 13 even though I was formerly a blasphemer and a persecutor and a violent aggressor” (1 Tim. 1:12-13). Paul viewed Christian ministry as a “mercy” and gift from God—not a burdensome and grueling duty (2 Cor. 4:1). In ministry. Gratitude isn’t just for my own spiritual health. True spirituality results in love for others. We not only need to give thanks for people we serve, but we need to teach this virtue as well. While all age groups need this, college aged people (18 to 24 year olds) are the least likely age group to express gratitude. In other words, those in college ministry have their work cut out for them! In children. As parents, we should teach our kids basic manners like saying “please” and “thank you.” But teaching biblical gratitude is far deeper (or even different) than good etiquette. We can start teaching gratitude young. My three year old son and I do our “three things” we’re thankful for almost every night. By expressing our gratitude with our kids, we model something life-changing in their development. When we sit around the dinner table, do we spend most of our time complaining about serving God? What might this communicate to our children as they listen to this? People were least likely to express gratitude in workplaces… despite wishing to be thanked more often themselves at work. Gratitude stands out in a world of narcissistic and ungrateful people. Paul writes, “Do everything without complaining or arguing, so that you may become blameless and pure, children of God without fault in a crooked and depraved generation, in which you shine like stars in the universe” (Phil. 2:14-15 NIV). He also writes, “Whatever you do in word or deed, do all in the name of the Lord Jesus, giving thanks through Him to God the Father” (Col. 3:17). What proportion of your prayer life is devoted to gratitude? What proportion of your thought life is devoted to gratitude? Are these proportions growing or shrinking with time? Would your loved ones and closest friends consider you to be growing in gratitude? Emphasis mine. Aristotle, Nicomachean Ethics (1124b1110–1114). Nikolai Tolstoy, Stalin’s Secret War (1981). Cited in Susan Ratcliffe, Oxford Treasury of Sayings and Quotations (Oxford: Oxford University Press, 2011), 196. G.K. Chesterton, St. Francis of Assisi, 74-77. Cited in Dale Ahlquist, G.K. Chesterton: The Apostle of Commonsense (San Francisco: Ignatius Publishers, 2003), 97. Robert Emmons and Michael McCullough, “Counting Blessings versus Burdens: An Experimental Investigation of Gratitude and Subjective Well-Being in Daily Life.” Journal of Personality and Social Psychology (Vol. 84, No. 2, 2003), 377. In this context, Paul encourages the rich Christians in Ephesus to be generous financial givers, but notice that he does so based on gratitude—not guilt (1 Tim. 6:17-19). Chuck Swindoll, “An Attitude of Gratitude,” sermon (found here). Philip Watkins, Positive Psychology 101 (New York: Springer Publishing Co., 2016), 74. Philip Watkins, Positive Psychology 101 (New York: Springer Publishing Co., 2016), 307. This is the description of the ‘gratitude visit’ exercise: “Participants were given one week to write and then deliver a letter of gratitude in person to someone who had been especially kind to them but had never been properly thanked.” Martin Seligman (et al. ), “Positive psychology in progress. Empirical validation of interventions” Tidsskrift For Norsk Psykologforening (Vol. 42, 2005), 879. This is the description of the ‘three good things’ exercise: “Participants were asked to write down three things that went well each day and their causes every night for one week. In addition, they were asked to provide a causal explanation for each good thing.” Martin Seligman (et al. ), “Positive psychology in progress. Empirical validation of interventions” Tidsskrift For Norsk Psykologforening (Vol. 42, 2005), 879. Seligman, M. P., Steen, T. A., Park, N., & Peterson, C. (2005). Positive Psychology Progress. American Psychologist, 60 (5), 410-421. Robert Emmons, Thanks! How the New Science of Gratitude Can Make You Happier (New York: Houghton Mifflin Co., 2007), 28. Robert Emmons, Thanks! How the New Science of Gratitude Can Make You Happier (New York: Houghton Mifflin Co., 2007), 30. Robert Emmons, Thanks! How the New Science of Gratitude Can Make You Happier (New York: Houghton Mifflin Co., 2007), 31. Robert Emmons, Thanks! How the New Science of Gratitude Can Make You Happier (New York: Houghton Mifflin Co., 2007), 31-32. Robert Emmons, Thanks! How the New Science of Gratitude Can Make You Happier (New York: Houghton Mifflin Co., 2007), 34. Alex M. Wood (et al. ), “Gratitude and well-being: A review and theoretical integration” Clinical Psychology Review (2010), 6. Alex M. Wood (et al. ), “Gratitude and well-being: A review and theoretical integration” Clinical Psychology Review (2010), 4-5. Alex M. Wood (et al. ), “Gratitude and well-being: A review and theoretical integration” Clinical Psychology Review (2010), 5. Lecture given for the John Templeton Foundation’s “Greater Good Science Center” (2014), Wendy Mendes, “Effects of Measured and Manipulated Gratitude on Biomarkers of Health and Aging.” Found here. Alex M. Wood (et al. ), “Gratitude and well-being: A review and theoretical integration” Clinical Psychology Review (2010), 7. Robert Emmons, Thanks! How the New Science of Gratitude Can Make You Happier (New York: Houghton Mifflin Co., 2007), 67. Sara B. Algoe (et al. ), “It’s the little things: Everyday gratitude as a booster shot for romantic relationships,” Personal Relationships, 17 (2010), 228. John Gottman, “Marital processes predictive of later dissolution: Behavior, physiology, and health,” Journal of Personality and Social Psychology, Vol 63 (2), Aug 1992, 221-233. Jeff C. Huffman (et al. ), “Feasibility and utility of positive psychology exercises for suicidal inpatients,” General Hospital Psychiatry, 36 (2014) 88–94. Robert Emmons, Thanks! How the New Science of Gratitude Can Make You Happier (New York: Houghton Mifflin Co., 2007), 5. Bullet points taken from Emiliana R. Simon-Thomas & Jeremy Adam Smith, “How Grateful are Americans?” Greater Good Magazine (January 10, 2013), found here.